Clarified butter is a product which is composed almost completely of fat utilizing a process which separates the water and milk solids from the butter fat. 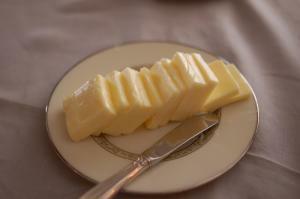 The butter needs to be heated so that the components can be separated by density. The heat makes the water evaporate and the solids sink to the bottom. Some solids also float to the surface during the heating, and later on they get skimmed off while their counterparts at the bottom get left behind as the clarified butter gets poured off. There is another form of clarified butter called ghee, and it has been used for numerous centuries. One can make clarified butter at home very easily. Clarified butter is often used for numerous different types of cooking applications because of its wonderful flavor and because of the fact that it has a fairly high smoking point. A tablespoon of clarified butter contains 130 calories, 10 percent of vitamin A, 9 grams or 45 percent of saturated fats, 40 milligrams or 13 percent of cholesterol and 14 grams or 22 percent of total fat. It does not contain any sodium, iron, carbohydrates, calcium, sugar, proteins or dietary fiber. All the calories contained in the clarified butter are from the fat content only. The butter does not get burned during frying and it is considered very healthy because it does not contain any hydrogenated oils. One should avoid consuming clarified butter in high quantities because it contains extremely large amounts of calories and saturated fats. One tablespoon of clarified butter is supposed to be an alternative for 4 tablespoons of any other cooking oil or butter. Clarified butter is commonly used for numerous purposes but it may also come in very handy for certain medicinal uses. It is supposedly very efficient in enhancing the health of the skin, promoting the overall health of the eyes, preventing constipation and treating different types of ulcers. It is also very beneficial in increasing the memory, promoting learning, treating blisters and burns and preventing the occurrence of various sorts of cancer. It is known for its potent antibiotic, antiviral and antioxidant properties so it may be of great help in fighting off the free radicals and reducing the amount and severity of damage they cause inside the body. It can also be very helpful for all those who suffer from medical conditions related to the digestive system. What Is The Significance Of Stool Changes? Would you recommend almond butter? Heart Diseases Part XVII - Fat - Friend Or Foe?